My weekend started off well. Rested for the most part after working long hours on Friday. On Saturday, I attended a friend's wedding, which was beautiful. It is always great seeing so much love between two people. There was a lot of dancing and chatting with friends at the wedding. On Sunday, I went out with my friend for dinner, drinks, and catching up. Definitely a fun weekend. I wish it was a bit longer. Anyway, how did you spend your weekend? Did you do anything diifferent or unusually? You look amazing!This is an awesome combo!Love it! i had a very restful weekend. Love the orange theme going on. Orange reallys looks good on you stella! So beautiful...I like the supermarket foto shoot idea, it's so amazing!!!! Am so much following you..you may do also follow me..
Are you kidding? 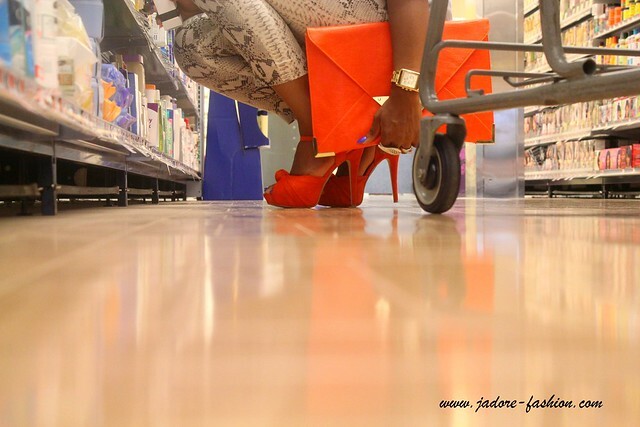 No you don't go grocery shopping like that! YOU ARE A KILLER!!!!!!!!!!!!! My weekends are the same as my weekdays, wash cook clean nothing new ever. I want your clutch and shoes! so so hot. I loved your look! I was in love with his pants and his clutch, wonderful! 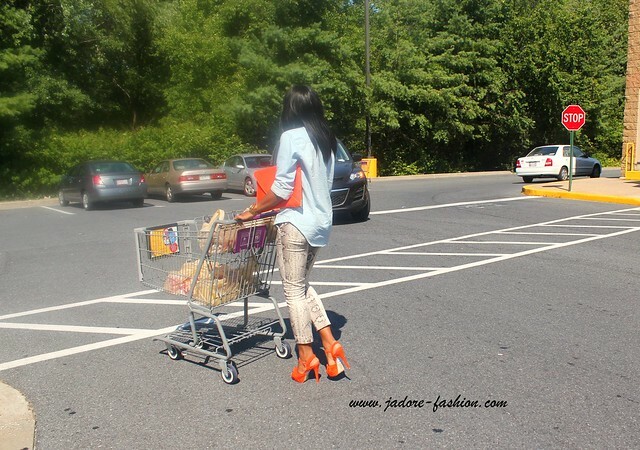 I bet you were the most fabulous thing at the grocery store! Love this. Those pants are hot!! Wow. 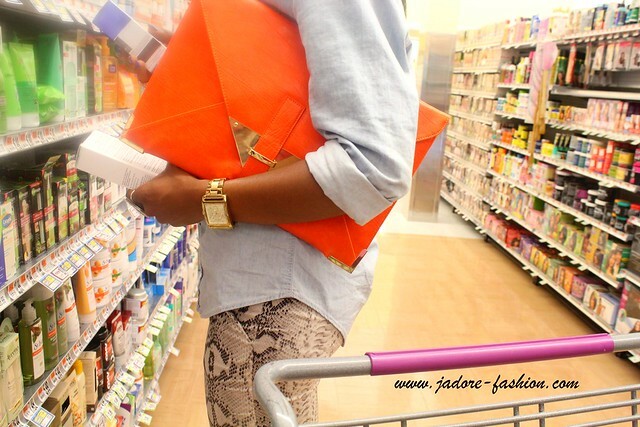 You make grocery shopping look so stylish! LOVE the pants! And I'm obsessed with denim shirts right now. Great outfit! Like that...at the grocery store?!? I love it!! I keep staring at the photos because you absolutely killed it. Love your style, I promise!! Simply Superb!!!!! The orange shoes and clutch make me so happy and the gray with it is so so so fabulous!!! Ummmm I need those pants. How long ago did you get them??? Check out my work blog too!! You are so glam, darling! very fabulous at the grocery store. great pants the print is very luxurious. love the pop of orange. Hahaha! Now this is how you grocery shop. Great photos. It made me smile. And because of you, I'm not coveting that ASOS envelope clutch. Is this how you go grocery shopping? Because you are looking FIERCE! your clutch and shoes ...aaaaaahhh I want!! !